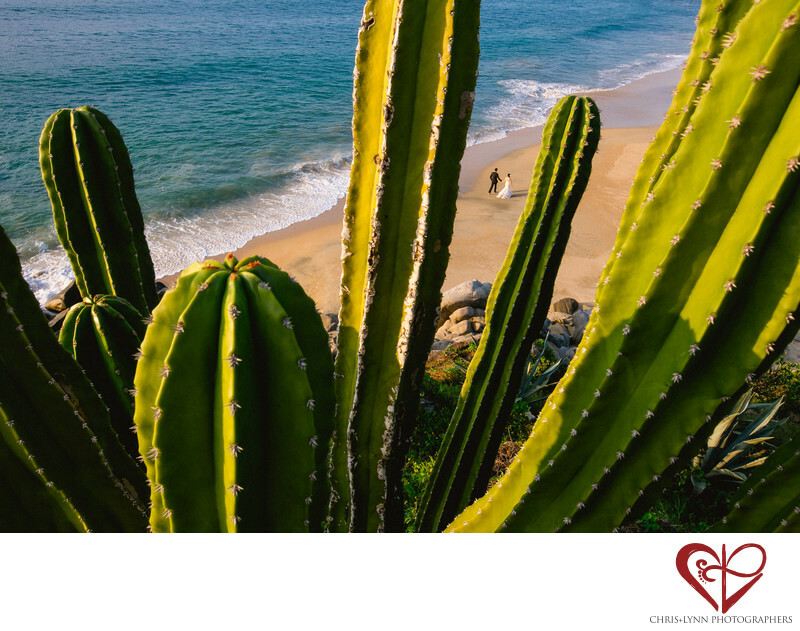 Cactus and ocean waves are quintessential Mexico! We always love to incorporate both when photographing wedding portraits in Mexico. This drone-like perspective was made possible from Chris balancing precariously over the edge of a 25 meter high rocky cliff. A Canon 16-35mm f2.8 wide angle lens was used to exaggerate the size of the cactus and enhance the illusion of great height. An aperture of f20 was selected to keep both the foreground cacti and the couple on the beach in the distance sharp. Teitiare Estate is one of our favorite private villas for destination weddings in Mexico due to its unique cliff-top 200 degree views over the Pacific Ocean, its bold color and tropical Mexican contemporary style, its private pocket beaches inaccessible to the general public, and magical reception location in the oceanfront palm grove. No other Sayulita wedding photography location offers quite the same variety of shooting locations in such a compact & private setting. Located just outside the small fishing village of Sayulita, about 40 minutes from the airport at Puerto Vallarta, Teitiare Estate is set in the jungle overlooking the Pacific. If you are searching for a private villa for your Mexican destination wedding you can find many options yourself via Airbnb and VRBO or book through a villa rental specialist such as Luxury Retreats. Our favorite villas in the Puerto Vallarta, Punta Mita, and Sayulita include Teitiare Estate, Villa Ninamu, Villa Pacifica, Casa Entre Rocas, Villa Palmasola, Villa Manzanillas, Casa Majani, Casa Querencia, Rancho 9, Casa Aramara, Villa Vatule, Casa Tres Soles, Estate Marietas, Villa Pacifico, Villa Solaz, Estate Casiopeia, Estate Jaguar, Casa del Faro, Casa Familia, Villa Mandarinas, Villa Estrella Mar, Villa Bahia, Villa Verano, and Villa Luna Creciente. To view a complete wedding day at Teitare Estate, please see this Featured Wedding by Chris+Lynn here. Location: Teitiare Estate, Calle Norte 200, Camino a La Playa Escondida, 63732 Sayulita, Nay., Mexico. 1/100; f/20.0; ISO 800; 27.0 mm.